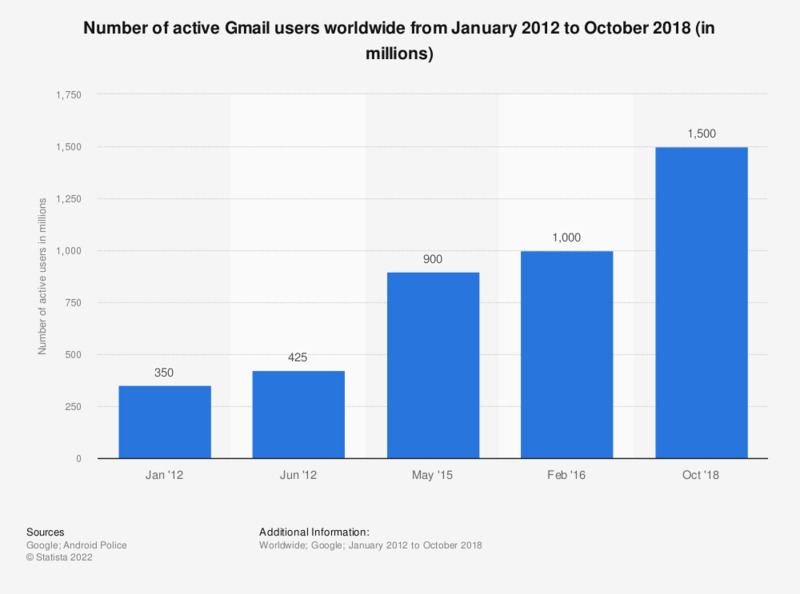 This statistic illustrates the number of active Gmail users worldwide from January 2012 to October 2018. As of the most recently reported period, Google's e-mail service had 1.5 billion active users worldwide. The online service is one of the most popular websites in the United States. E-mail is one of the most common digital communication methods worldwide – first made popular as an easily accessible service offered by many providers, it has now made the successful transition to mobile. Despite the increasing growth of mobile messenger apps, e-mail has remained the leading online communication channel. E-mail access is one of the most popular mobile internet activities worldwide with Google Mail constantly ranking as one of the most popular mobile apps in the United States. Due to its large user base, e-mail is an attractive channel for cyber criminals. Spam accounts for over half of all global e-mail traffic and many countries are targeted by malicious mailshots. According to global internet users, e-mail accounts were most in need of secure passwords, ranked right after online bank accounts. Furthermore, 38 percent of adults in the United States are concerned about government surveillance regarding e-mail communication. Despite this widespread concern, only two percent of U.S. adults are using e-mail encryption programs. Previous figures are from older reports. Thinking of each following situations, have you used email to inform people?